To Cite: Kardooni T, Rahdar M, Teimoori A, Rafiei A. Evaluation of LACK Gene Diversity in Leishmania major Using PCR and Sequencing Methods, Jundishapur J Microbiol. 2018 ; 11(1):e14606. doi: 10.5812/jjm.14606. Background: Cutaneous leishmaniasis is one of the most important tropical diseases in many parts of the world caused by two main species of parasites including Leishmania major and L. tropica in the old world. Several attempts have been made to reach an effective and reliable vaccine against the disease with a spectrum of success. Selection of an effective target for vaccination needs to recognize a protein antigen with minor diversity. Leishmania activated C kinase (LACK) antigen is one of the good targets for this purpose that needs to be evaluated for its diversity in local study areas. Objectives: This study was conducted to evaluate the diversity in LACK protein among L. major species. Methods: We collected 30 L. major isolates from different parts of Khuzestan province, southwest of Iran. Leishmania activated C kinase gene was selected for amplifying by PCR and sequencing. Results: Phylogenetic tree showed that there is no diversity in LACK gene in this area. Conclusions: Leishmania activated C kinase gene is a very conservative gene, suitable for vaccination. Leishmania is an intracellular parasite in variety of mammals with worldwide distribution reported from 87 countries in the world. Seventy five percent of all world leishmaniasis cases occur in 10 countries including Afghanistan, Iraq, Algeria, Colombia, Brazil, Iran, Syria, Ethiopia, Sudan, Costa Rica, and Peru (1). Iran is one of the endemic or hyperendemic regions with almost 20000 new cases annually. Cutaneous leishmaniasis (CL) has been reported from 17 out of 31 provinces of Iran (2). Iran is surrounded by many infected countries such as Afghanistan, Pakistan, and Iraq. The transmission occurs through refugees and religious visitor's activities. In recent years, a variety of clinical features has been reported about CL in this area indicating that parasite behaviors have changed towards resistance to conventional drugs and development of a variety of lesion shapes due to different parasite genotypes from neighbor countries. The existence of several genotypes interferes with achievement of uniform vaccine for controlling CL. Leishmanization with live promastigotes of Leishmania major was first introduced in 1970s in Israel, then in Iran in 1980s (3). Currently, live attenuated vaccines, killed vaccines, recombinant, and DNA vaccines are administered with variety of success in human and experiment animals (4). Several studies reported that Leishmania activated C kinase protein (LACK) vaccine in combination with recombinant IL12 can successfully protect Balb/c mice against leishmaniasis (5-7). Leishmania activated C kinase protein has a weight of 36 KD and as a highly immunogenic protein, is very conserved in many Leishmania species in both stages of promastigote and amastigote (8). Although the exact role of LACK in parasites is not clear, it is suggested that LACK has a critical role in viability of parasites and multiplication ability in infected macrophages (9). Leishmania activated C kinase protein serves as a transduction signal to perform many vital processes in eukaryote cells for example in RNA processing and cell control (10). To design a reliable local vaccine using LACK protein, we need to identify exact diversity and polymorphism of LACK gene in this region. Therefore, this study was conducted to evaluate LACK gene diversity of L. major in different parts of Khuzestan province, southwest of Iran. The protocol of the study was evaluated and approved by the ethics and research committee of Ahvaz Jundishapur University of Medical Sciences with the approval number 94122 - 2015. Written informed consent was provided by all adult participants, and for minors, it was obtained from their parents. Khuzestan province is located in southwest of Iran bordering with Iraq in the west and Persian Gulf in the south, with latitude 31° 19' 38.28″ N and longitude 48° 41′ 38.4″ E. The province covers the area of 63,238 km2 and has mountain and hills in the north and flat and marshland in the south. Three major rivers irrigate the province areas. The temperature is very high and can usually reach up to 55°C in summer. The range of temperature is between -5°C in winter to 55°C in summer. Many parts of Khuzestan province comprise deserts with sandstorms in many times of the year. Annually, the rate of raining is low as 322.6 mm per year; therefore, the province is considered an arid zone. According to early national census, the population of Khuzestan province is 4,531,720 people with 64% rural, 35% urban, and 1% non-residency (11, 12). The capital of Khuzestan province is Ahvaz. In the current study, study areas were selected from the north, south, west, east, and central parts of the province as shown in Figure 1. The study areas are shown with black spots. 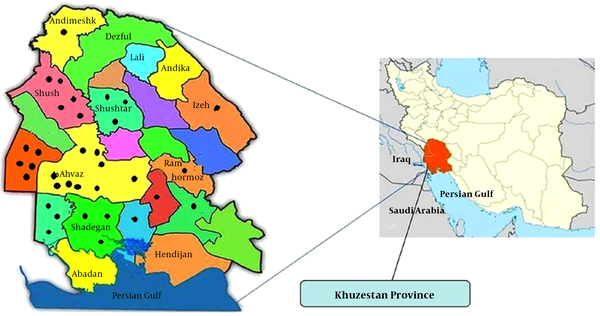 In this observational cross-sectional study, 30 curetting samples of the lesions from infected patients with CL were collected from different parts of Khuzestan province. One sample of Iranian standard L. major also was obtained from health school of Tehran University of Medical Sciences. First, the samples were cultured in NNN media and incubated at 22°C for 7 days and then transferred to RPMI 1640 media (Sigma, Germany) with 20% FBS (Sigma, Germany) and penicillin-streptomycin 100UI/mL (Sigma, Germany) for further proliferation of promastigotes. After culturing, the promastigotes were centrifuged at 3000 rpm for 5 minutes and then, they were collected and stored at -20°C until performing molecular techniques. DNA was extracted using QIAamp DNA mini kit (QIAGEN, Germany) according to manufacturer’s instruction. To distinguish L. major from L. tropica, PCR method was employed using Sinaclone Kit (Shiraz, Iran). 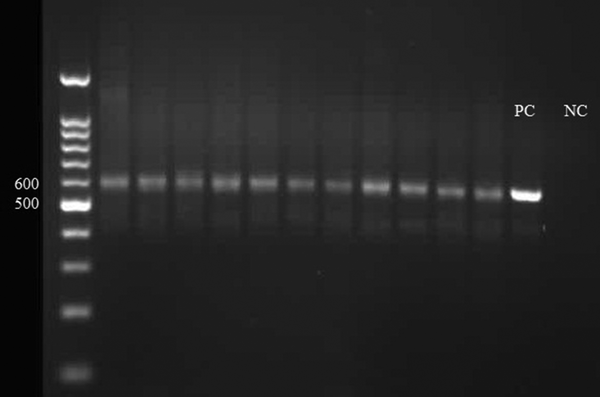 In the PCR assay, 620 bp nucleotide bands introduce L. major. The primer pairs were used from kinetoplast DNA minicircle that included forward: GGG GTT GGT GTA AAA TAG GG and reverse: TTT GAA CGG GAT TTC TG (13). The PCR was performed in a final volume of 25 µL including master mix 12.5 µL, primers 2.5 µL, DNA sample 5 µL, and DDW 5 µL. The PCR process consisted of 3 minutes at 95°C, 30 seconds at 63°C, 1 minute at 72°C running for one cycle followed by 35 cycles consisted of 40 seconds at 93°C for initial denaturation, 40 seconds at 63°C for annealing, and 1 minute at 72°C for extension. 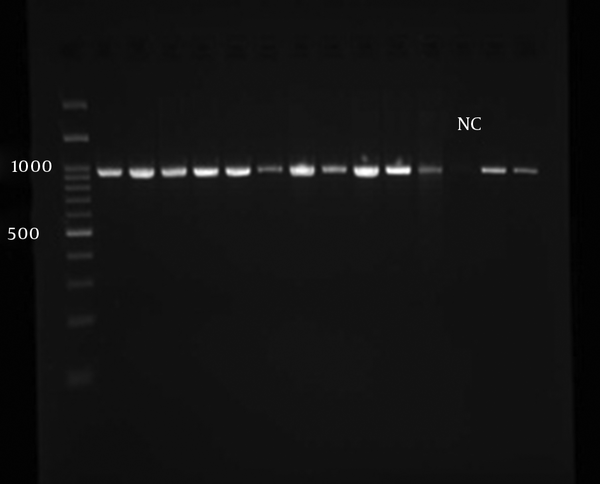 The electrophoresis of PCR products was performed using gel agarose 2% and ethidium bromide and the bands were appeared by gel documentation apparatus. After L. major confirmation in all samples, the region of coding of LACK gene was amplified using the following primers: Forward: 5 - ACCATGAACTACGAGGGTCACCT - 3 and Reverse: 5 - TTACTCGGCGTCGGAGAT -3 (14). The process of PCR included five minutes at 96°C for initial denaturation followed by 30 cycles of 1 minutes at 96°C for denaturation, 1 minute at 51°C for annealing, 90 seconds at 72°C for extension, and 10 minutes at 72°C for final extension. PCR yields were sent to SEQLAB (Germany) for LACK gene sequencing. Nucleotide sequence was compared with other booked sequences in gene bank (NCBI) and a phylogenetic tree was drawn using likelihood drawing. Mega 6 and Bioedite software were used for drawing the phylogenetic tree. In this study, 12 out of 30 (40%) patients were male and 18 (60%) were female. The age of most patients ranged between 21 and 30 years. The infection was seen in patients aged from 2 to 80 years. The lesions were seen more in the hands of patients in 21 out of 30 (70%) cases followed by foot 9 out of 30 (30%) cases and face with 20% involvement. In four cases, the lesions were seen in more than one site. In 50 percent of the patients, they had more than one lesion. Primary molecular evaluation to distinguish L. major from L. tropica revealed that all species in the study area belonged to L. major with 620 bp nucleotide (Figure 2). Distinguishing L. major from other Leishmania species was done by appearing different bands in the electrophoresis of PCR products. L. tropica and L. infantum produce 800 bp nucleotide in PCR. Positive control (PC) and negative control (NC). After L. major confirmation, PCR reaction was performed for amplifying LACK gene on all the isolated Leishmania. Figure 3 shows approximately 939 bp nucleotide bands. The PCR products of all samples were sequenced and compared with Friedline reference strain. There was no difference between all the isolated Leishmania strains and they also did not differ with Friedline reference strain. However, Tehran strain differed only in one nucleotide when compared with other samples and with Friedline strain in which cytosine was replaced by thymine. This change did not lead to the change of acid amine in LACK molecule. The phylogenic findings showed that all L. major isolates from Khuzestan and Friedline and France isolates (U27568) were in the same clade but according to nucleotide sequence, L. major, L. tropica, and L. infantum from Tehran isolates were set to different clades. These data show that there are minor differences between Khuzestan and Tehran isolates that may be a beginning genetic variation for LACK gene of L. major (Figure 4). Iran is one of the endemic areas for CL in the world. 17 out of 31 provinces of the country are involved in the disease. Annually, several CL cases are reported by hygienic centers and clinics from Khuzestan province as well as from other infected areas in Iran. The use of conventional drugs for treatment of the disease has some limitations such as drug resistance, long period of treatment, and many drug side effects. The control of parasite vectors and reservoir hosts (rodents) is very difficult and in some areas is not possible. Therefore, achieving an effective and reliable local vaccine is necessary. The use of host keeping and conserved genes for developing vaccines against Leishmania has been considered by many investigators. The LACK gene as an appropriate target has been introduced (5-7). In this study, we collected 30 samples of CL from different parts of Khuzestan province. L. major was confirmed by PCR technique in all samples and amplification of total LACK gene was performed. According to this study, L. major is the predominant species causing CL in this region. Reports from other parts of Iran also indicate that the main causative agent for CL is L. major in Semnan, Golestan, North Khorasan, Isfahan, Fars, Hormozgan, and Ilam provinces whereas the predominant species in Kerman, Yazd, and Razavi Khorasan provinces has been L. tropica (15). Sarkari et al. presented the most diversity in L. major and the least diversity in L. tropica using PCR on nagt (N-acetylglucosamine-1-phosphate transferase) gene in Fars, south of Iran (16). Hajaran et al. showed that there are 5 haplotypes of L. major, 8 haplotypes of L. tropica, and 4 haplotypes of L. infantum (17). It seems that nagt gene is better than LACK gene to indicate diversity of Leishmania species in this area. Spotin et al. used Cyt b and ITS-rDNA and microsatellite genes for presenting diversity in Leishmania species in Khuzestan province, south west of Iran. More than 90% of the isolated Leishmania in suspected patients were related to L. major and 10% to L. tropica. They showed 3 haplotypes of L. major using Cyt b amplifying; however, surveying ITS-rDNA gene did not show any diversity in L. major (18). Sample sequencing revealed that this area has no diversity in LACK gene except for one change in nucleotide base observed in Tehran strain without any change in acid amine arrangement. There was no different nucleotide arrangement between isolated samples and Friedline strain in LACK gene. The phylogenetic tree was created using Mega 6 software to evaluate the relationship between the study isolates (Figure 4). All of the collected samples in this area showed a similar arrangement in LACK gene with 939 bp nucleotides. This nucleotide arrangement had 100% homology to Friedline strains. Zhang et al. reported that there are minor differences between 22 Leishmania strains isolated from four districts of China. Although they found minor differences in sequenced LACK gene in L. donovani complex, L. turanica, L. gerbil, and Sauroleishmania, they concluded that LACK gene is not a useful tool for indicating diversity in Leishmania species due to the conservation of the gene (19). This study presented LACK gene as one of the most conservative genes in L. major that can be a good target for vaccination in this area but not useful for identifying diversity in Leishmania species. We gratefully thank Dr. Mohebali and Dr. Hajjaran for preparation of Iranian L. major species. Funding/Support: This study is a part of a Ph.D thesis (submitted by Miss. Kardooni) that financially was supported by health research institute, infectious and tropical diseases research center, Jundishapur University of Medical Sciences. 1. Alvar J, Velez ID, Bern C, Herrero M, Desjeux P, Cano J, et al. Leishmaniasis worldwide and global estimates of its incidence. PLoS One. 2012;7(5):35671. doi: 10.1371/journal.pone.0035671. [PubMed: 22693548]. 2. Yaghoobi-Ershadi MR, Marvi-Moghadam N, Jafari R, Akhavan AA, Solimani H, Zahrai RAR, et al. Some epidemiological aspects of cutaneous leishmaniasis in a new focus, central Iran. Dermatol Res Pract. 2015;2015:286408. doi: 10.1155/2015/286408. [PubMed: 26483838]. 3. Noazin S, Modabber F, Khamesipour A, Smith PG, Moulton LH, Nasseri K, et al. First generation leishmaniasis vaccines: A review of field efficacy trials. Vaccine. 2008;26(52):6759-67. doi: 10.1016/j.vaccine.2008.09.085. 4. Handman E. Leishmaniasis: current status of vaccine development. Clin Microbiol Rev. 2001;14(2):229-43. doi: 10.1128/CMR.14.2.229-243.2001. [PubMed: 11292637]. 5. Afonso LC, Scharton TM, Vieira LQ, Wysocka M, Trinchieri G, Scott P. The adjuvant effect of interleukin-12 in a vaccine against leishmania major. Sci. 1994;263(5144):235-7. [PubMed: 7904381]. 6. Mougneau E, Altare F, Wakil AE, Zheng S, Coppola T, Wang ZE, et al. Expression cloning of a protective leishmania antigen. Sci. 1995;268(5210):563-6. [PubMed: 7725103]. 7. Ghaffarifar F, Jorjani O, Sharifi Z, Dalimi A, Hassan ZM, Tabatabaie F, et al. Enhancement of immune response induced by DNA vaccine cocktail expressing complete lack and tsa genes against leishmania major. Apmis. 2013;121(4):290-8. doi: 10.1111/j.1600-0463.2012.02968.x. 8. Gurunathan S, Sacks DL, Brown DR, Reiner SL, Charest H, Glaichenhaus N, et al. Vaccination with DNA encoding the immunodominant lack parasite antigen confers protective immunity to mice infected with leishmania major. J Exp Med. 1997;186(7):1137-47. [PubMed: 9314562]. 9. Gonzalez AG, Taladriz S, Marquet A, Larraga V. Molecular cloning, cell localization and binding affinity to DNA replication proteins of the p36/lack protective antigen from leishmania infantum. Eur J Biochem. 1999;259(3):909-16. [PubMed: 10092881]. 10. Kelly BL, Stetson DB, Locksley RM. Leishmania major LACK antigen is required for efficient vertebrate parasitization. J Exp Med. 2003;198(11):1689-98. doi: 10.1084/jem.20031162. [PubMed: 14657221]. 11. Khazaei S, Mohammadian HA, Saatchi M, Salehiniya H, Nematollahi S. Epidemiological aspects of cutaneous leishmaniasis in Iran. Arch Clin Infect Dis. 2015;10(3). doi: 10.5812/archcid.28511. 12. Wikipedia . Khuzestan province. 2017. Available from: https://en.wikipedia.org/wiki/Khuzestan_Province. 13. Pourmohammadi B, Motazedian M, Hatam G, Kalantari M, Habibi P, Sarkari B. Comparison of three methods for diagnosis of cutaneous leishmaniasis. Iran J Parasitol. 2010;5(4):1-8. [PubMed: 22347259]. 14. 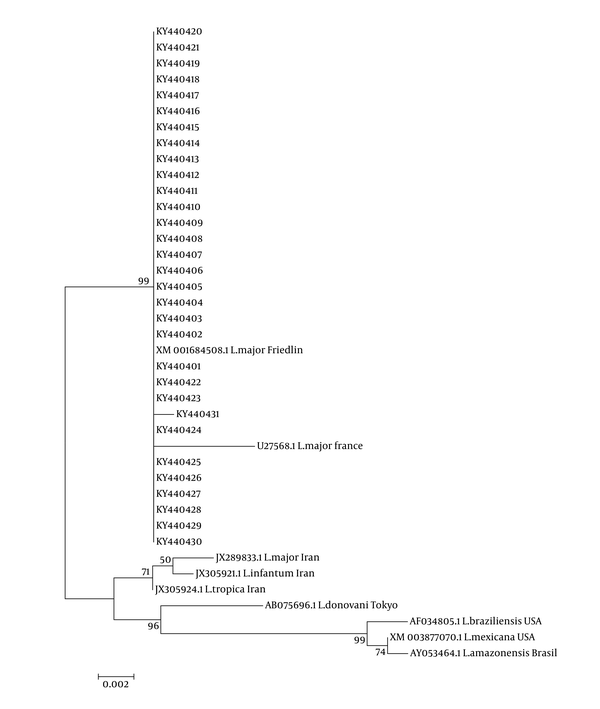 Zhang CY, Lu XJ, Du XQ, Jian J, Shu L, Ma Y. Phylogenetic and evolutionary analysis of Chinese leishmania isolates based on multilocus sequence typing. PLoS One. 2013;8(4):63124. doi: 10.1371/journal.pone.0063124. [PubMed: 23646184]. 15. Mahmoudzadeh NH, Ajdary S, Riazi RF, Mirzadegan E, Rezaeian A, Khaze V, et al. Molecular epidemiology of cutaneous leishmaniasis and heterogeneity of leishmania major strains in Iran. Trop Med Int Health. 2012;17(11):1335-44. doi: 10.1111/j.1365-3156.2012.03078.x. [PubMed: 22947226]. 16. Sarkari B, Ahmadpour NB, Motazedian MH, Mirjalali H, Akhoundi M, Mohebali M, et al. Inter- and intraspecific variations of leishmania strains isolated from patients with cutaneous and visceral leishmaniases in fars province, south of Iran. Iran J Med Sci. 2016;41(3):209-16. [PubMed: 27217605]. 17. Hajjaran H, Mohebali M, Teimouri A, Oshaghi MA, Mirjalali H, Kazemi RE, et al. Identification and phylogenetic relationship of Iranian strains of various leishmania species isolated from cutaneous and visceral cases of leishmaniasis based on n-acetylglucosamine-1-phosphate transferase gene. Infect Genet Evol. 2014;26:203-12. doi: 10.1016/j.meegid.2014.05.026. [PubMed: 24911282]. 18. Spotin A, Rouhani S, Parvizi P. The associations of leishmania major and leishmania tropica aspects by focusing their morphological and molecular features on clinical appearances in Khuzestan province, Iran. Biomed Res Int. 2014;2014:913510. doi: 10.1155/2014/913510. [PubMed: 25317423]. 19. Zhang CY, Zhou J, Ding B, Lu XJ, Xiao YL, Hu XS, et al. Phylogenetic analysis of lack gene sequences for 22 Chinese leishmania isolates. Infect Genet Evol. 2013;17:79-86. doi: 10.1016/j.meegid.2013.03.026. [PubMed: 23541410].